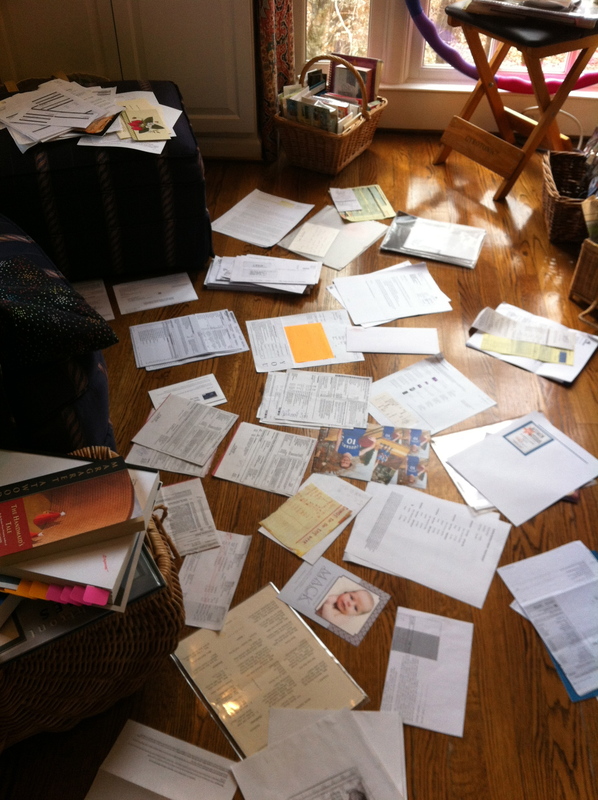 I have a basket where I pile things that need to be done–bills, invitations, bank statements, receipts, hotel and airline confirmations, soccer schedules. Generally, the plan is that I go through it once a week. Well, there was Christmas, then Vermont, then a big writing project, then guests…. Yesterday I began to sort, and I’m still not to the bottom of the stack. And this is just my non-writing pile. But I have to say, I do love piling. Do you? Paper stacks make me itch. I just weeded through a 2 month stack on my desk, and it’s still not done. Putting writing first does strain the rest. Yes, it’s unbelievable how stuff piles up. I have the same basket system and the same issue with the basket becoming too full. And welcome to Catching Days. Thanks for taking the time to leave a comment. I’m at the halfway mark of book edits, and you should see my desk. No, I take that back. I need to clean it off first. Ha! Sounds like fun-good luck with the second half. I know this is a bit off topic, but I just read your WONDERFUL series on reading like a writer. I was just was I was looking for. I knew there was a way to reading strategically, but your series really help me pin down the important question I need to ask when reading like a writer, so I thank you for that. During that series, however, you mentioned a CD of lecture given by of Douglas Glover. Is there any way to get a copy of that, or download it anywhere? Dwayne, welcome to Catching Days and thanks so much for your kind words about my reading series. I’m glad to know it was helpful. That CD is only available to VCFA students, but I’ve sent Doug an email to ask if the lecture is available any other way. I’ll let you know if it is. I do know that Doug has a new craft book coming out in April, Attack of the Copula Spiders. Nonetheless, I’ll be keeping my fingers crossed in hopes that Doug will have mercy on me, someone who has truly, truly, truly been looking for information on reading like a writer for months. And then imagine, one day, discovering your website, and realizing that there was really someone out there who shared my interest of such a nuanced topic; it was pure ecstasy! So, thanks for helping me and I’ll keep my fingers crossed. For copyright reasons, it’s a no-go on the CD, but whenever Doug approaches texts, it’s reading like a writer. So check out his posts at Numero Cinq. And I recommend all his essays. His new book Attack of the Copula Spiders will include How to Write a Novel, How to Write a Short Story: Notes on Structure and an Exercise, The Drama of Grammar, The Mind of Alice Munro, Novels and Dreams, A Scrupulous Fidelity: On Thomas Bernhard’s The Loser. Then there’s an essay out there somewhere called “How to Read a Mark Anthony Jarman Story,” which is about how to read for rhetorical devices. And his book The Enamoured Knight is about reading Don Quixote. Hope this helps! Thanks for your help. Appreciate it. I have actually be checking out the website NC, and been reading some of the wonderful lectures by Doug’s students. Some great stuff. Thank you again. I don’t really like piling; piling just happens! When I sit down to Confront the Pile, I tend to sort things into new piles. These new piles have a bad habit of taking up residence on the Dining Room table until we need it to entertain… then, whoops, original pile reforms to be stashed again. Another wonderful image–my piles chattering to each other. Thanks, Susanna!